Standing along the banks of Yamuna River, the Taj Mahal with its white gleaming marble looks out of place is the populous city of Agra. However, this has done nothing to detract visitors from its beauty and marvelous architecture. When looking at the Taj Mahal, a person may wonder what was the reason that this structure was built. As a tourist if you visit the Taj Mahal, there will be several guides willing to offer their services to you and explain in details the reasons why the Taj Mahal was built. However, it does not take a guide to tell you that this structure was built to demonstrate undying love and preserve the memory of that love. Agra, which is home to the Red Fort, used to be the capital of the Mughal Empire in India before it was shifted to Delhi in the year 1637. It was from here that Shah Jahan and his wife left for Burhanpur in order to quell a rebellion. Mumtaz Mahal, a Persian princess, had just given birth to the couple's fourteenth child and unfortunately, she died due to complications of childbirth. It is said that the emperor was so devastated at the death of his wife that within a few months his hair and beard turned white. 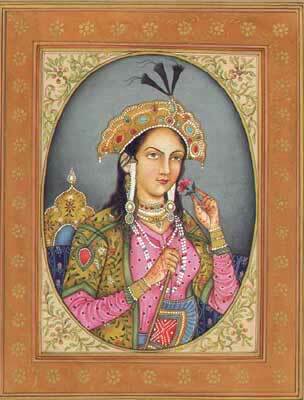 It is claimed that while the couple was married, Mumtaz Mahal made her husband promise her four things. The first promise was that he would construct the Taj Mahal for her; the second was that he would remarry in case of her demise; the third was that he would always be kind to their offspring; and fourth promise was that he would visit the tomb every year on her death anniversary. Unfortunately, Shah Jahan could not fulfill all the four promises, but he did fulfill the first and the second promises. 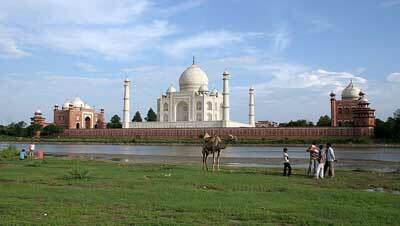 After Mumtaz Mahal died, Shah Jahan went about constructing the Taj Mahal. The constructed started in 1631 and would continue for the next 22 years. It is estimated that nearly 20,000 workers worked to build it. The main design of the mausoleum was the brainchild of an Iranian architect named Ustad Isa and the materials to build the Taj were sourced from all across India and some parts of central Asia. The Taj Mahal sits on top a foundation composed of red sandstone and this truly highlights its pure white marble structure. The structure has a terrace on which the massive dome of the Taj is situated, and on all four sides of the dome are minarets. Inside the dome is the tomb of Mumtaz Mahal and it is decorated with jewels. While all the objects in the mausoleum are in complete symmetry and harmony, just Shah Jahan's tomb stands out, as he was laid to rest besides his beloved wife and this was an afterthought. So, one can say that the Taj Mahal is a tribute to love and it would explain why lovers from all over the world come here to pay their respect. Every aspect of the construction is homage to eternal love. The gate leading to the Taj Mahal has been compared to a veil covering the beauty of a woman's face. In Muslim and Hindu wedding traditions, the veil hides the beauty of the bride and it has to be lifted away gently to reveal that beauty. The dome built of sheer white marble is laid against the backdrop of Yamuna River, which is responsible for changing the view of the Taj at different hours due to the water reflection. In the light of the moon, the Taj glows like a golden crown, in the dawn hours; it appears pinkish in color; while in the evening hours it appears white like milk. All these different colors add to the attraction and marvel of the Taj and are reminiscent of the moods that a woman displays. Thousands of poems can be written about the reason why the Taj Mahal was built; how its beauty reflects the beauty of a woman; and how there is always hope for eternal and long-lasting love for every person on this earth. Shah Jahan found his true love in Mumtaz Mahal and eternalized it with the Taj. What Year Was The Taj Mahal Built ? Where Is The Taj Mahal Located ? Who Was The Architect Of The Taj Mahal ? The Taj Mahal, which signifies the love of Emperor Shah Jehan and his wife Mumtaz Mahal, is located on the banks of River Yamuna in Agra. It took 22 years to built this beautiful and appealing structure. The construction started in 1632 and was finished by 1653. Thousands of craftsmen and architects were hired to complete it. More..